This Is The Biggest Intercooler Offered For Your "R" In A Kit. Featuring A New Design For An Easier Install. VERSION 3.0 Be sure to check my other auctions for my Performance Race Downpipe, Ram Air Kit, and Turbo Intake Pipe. No one else has been able to mount their intercooler setup like we do. This massive intercooler core fills up the front more than anyone else's. Other manufacturers have taken pictures of an intercooler filling up their entire front only to leave you disappointed when you install yours. Our GSX FMIC looks just as good as it performs. The instructions are straight forward and we offer full installation support. And we are the only ones that do not require you to drain your A/C system. Top mounted piping allowing for fog-light cold air intake (CAI) setups. Shorter piping runs allowing for quicker response with less turbo lag. Replaces all of the stock plastic cold side piping with heavy-gauge space shuttle grade polished aluminum piping. Maintains all factory sensor mount locations. No need to drain your A/C system saving you unforeseen headaches and costs. Designed and engineered specifically for the Volvo S60R / V70R. Also fits 2001 to 2003 T5 FWD's (must mention year and model at checkout). The GSX FMIC is engineered to improve the power and efficiency of your forced induction system. This system uses a large Bar and Plate type core properly sized to safely deliver reduced intake temperatures and maximize power output on applications rated up to 600 hp and designed to withstand up to 50psi boost pressure. At 18.5 psi of boost pressure, the GSX Intercooler system delivers an 18 hp increase at the wheels over the factory intercooler system. With its large bar-and-plate type core, our intercooler system is designed to safely handle 600hp. That means that even at the higher boost pressures and extreme temperatures required to produce 600hp the GSX intercooler system is working within design specifications and is capable of delivering optimal performance. Our intercooler system is what Volvo should have designed this car with. By using a large 24 X 11 X 3 bar and plate core, we simultaneously increased thermal efficiency and reduced pressure drop. If your stock turbo is only producing 14.5 PSI boost with a 1.5 PSI pressure drop, that means that your system will be equivalent to13 PSI. You can turn the boost up, but thats only creating more work for the turbo and reducing its lifespan. 4% pressure drop, less resistance for the turbocharger allows for faster spool up and improved response. Our intercooler system uses 2.5 diameter high strength 2mm aluminum intercooler piping. All piping is mandrel bent from the factory and includes all sensor and vacuum connections. The couplers are of the highest quality having 4 to 6mm thickness and should never need replacing. Ranked on a scale of 1 to 10, with 1 being changing a tire and 10 being an engine rebuild, the installation of this system is a 4. If youre severely intimidated by changing a tire or doing an oil change, you may want to consider having a friend or a local performance shop do the install. The GSX S60R / V70R Front Mount Intercooler System is designed to be a true bolt-in system that can be installed by the home mechanic using standard tools. No welding, machining or fabricating is required and all components are designed to assemble easily and provide a professional finished appearance. Minimal trimming of factory components is required. Estimated installation times will vary depending on the mechanical skills of the installer. For an experienced mechanic or tuning shop the installation should require 6-8 hrs. Installation times for the average home mechanic will vary according to mechanical abilities. So, whether your plans involve increasing boost pressure or installing a larger turbocharger, our intercooler system is a must to meet your intercooling needs. While the GSX intercooler system will work beautifully with a stock system, performance gains will be more pronounced with modifications such as an ECU upgrade, K&N air filter, performance downpipe, and a lower restriction exhaust (also available on this site). Feel free to contact me for any questions or offers. ONLY AVAILABLE WITH BLUE COUPLERS. 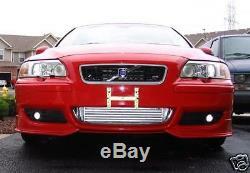 The item "Volvo S60R S60 V70R Front Mount Intercooler FMIC Kit" is in sale since Thursday, August 16, 2012. This item is in the category "eBay Motors\Parts & Accessories\Car & Truck Parts\Turbos, Nitrous, Superchargers\Turbo Chargers & Parts". The seller is "race-s60r" and is located in Chicago, Illinois. This item can be shipped worldwide.